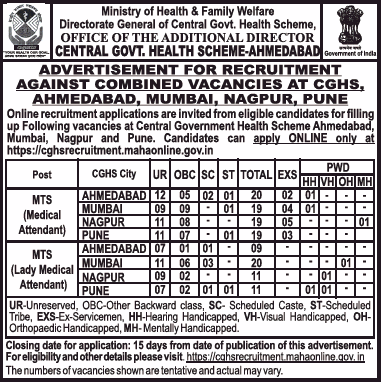 CGHS Recruitment: Central Government Health Scheme has released the notification for Multitasking Staff posts. CGHS Online applications are invited from the prominent candidates. The candidate willing to work with CGHS Jobs ensure your eligibility before applying. Applicant should possess 10th and Certificate in first aid as the educational qualification. Candidates for CGHS Recruitment will be selected based on their satisfactory performance in the written test or in the personal interview. Selected candidates for CGHS Recruitment 2018 will receive handsome emoluments on monthly basis. Scroll down for more details about the selection process, application method and other details are provided below. Apply for the desired post before the closing date of 15th June 2018. Dear Aspirants, CGHS has declared the recruitment to engage the young ones for 08 MTS jobs. CGHS Online applications are invited from eligible individuals who are having a passion to join in CGHS Recruitment 2018. CGHS online application is currently active, so rush to apply before 15th June 2018 for CGHS recruitment 2018. Furthermore, details like Qualification, How to apply, and Selection process are given in the below section. 10th and Certificate in First Aid. The candidate will be selected based on their performance was done on written test /Personal Interview. Download the official notification from below link, in which the application form. From the homepage, you can find the navigation button for relevant notification. Read it carefully once before to apply for CGHS recruitment and apply according to the procedure as given in the notification. If you satisfy the eligibility criteria then do register and apply for the post. Affix a recent passport size photograph. And submit the application before 15th June 2018. CGHS Recruitment 2018: Apply here for 128 MTS Jobs & Apply online CGHS Jobs. Central Government Health Science has announced the notification to engage 125 MTS jobs. Apply online CGHS Recruitment; applications are invited from the eligible individuals. Candidates ensure your eligibility before to apply online CGHS recruitment. Applications can be acceptable from Ahmedabad, Mumbai, Nagpur, Pune location to enroll the young one for CGHS recruitment. Desirable candidates who satisfy the eligibility criteria can apply online CGHS here using the direct link. So, the qualified candidates can file your applications against CGHS Recruitment. Please check the official notification and apply according to the procedure for CGHS Recruitment. Interested candidates advised reading this article for the simplified procedure to apply for CGHS Recruitment. Dear Aspirants, CGHS Recruitment has declared to engage the young ones for 125 MTS jobs. There are 125 vacancies to fill up. Online CGHS applications are invited from eligible individuals who are having a passion to join in CGHS Recruitment 2018. The pliant can find the application at the official website. CGHS online applications is currently active, so rush to apply before 03rd March 2018 for CGHS recruitment 2018. Furthermore, details like Qualification, How to apply, and Selection process are given in the below section. Entrant who have completed their Graduation/Post Graduation or its equivalent from any recognized university / Institution are eligible to apply for CGHS recruitment. The candidate will be selected based on their performance done on written test /Personal Interview. In the home page you can find the navigation button for relevant notification. Fill in the application and submit before 03rd March 2018.